Luckily for you and me this is an adventure easy on the pockets! This time hop will only cost you 600 Yen or about $5. Your ticket gives you access to all eight stories of the castle! 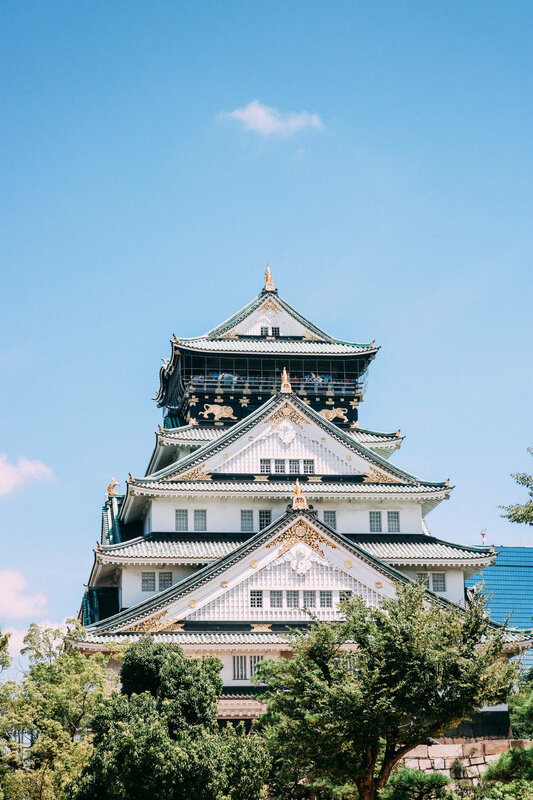 Each level is complete with an exhibit and tons of information on the history of Osaka and this castle. While it maybe open seven days a week, it is not necessarily open all year long. It is open from 9:00 am - 5:00 pm with the last admission at 4:30 pm. Durning holidays and other seasonal exhibits the castle may stay open for longer hours. It is closed from December 28th until January 1st every year. The only down side to the castle was that in order to fully get the experience and information, it seemed you needed to purchase the audio tour. There were some english explanations and placards but in my opinion not enough to fully grasp the history. I thought it was amazing all the exhibits, holograms, and actually artifacts they had on display. One thing to note is your experience can change during the seasons! For one thing, we came in the heart of summer when it was HOT. If you come during any of the summer months to not travel without a personal fan! Perhaps the best time to visit the castle is Spring Time. In front of the Castle is Nishinomaru Garden which is home to tons of cherry blossom trees! It is on my bucket list to see the Cherry Blossoms in Japan so I will be back! Being that this was our first day and outing in Japan, I was beyond impressed with how beautiful this country was already. Not only was it SO clean [I could not spot a piece of trash on any corner of the streets], but everything so visually pleasing! From buildings to plants I was in absolute photo heaven. So much beauty every where I turned!